Here are a couple of the “paintings”I tried so unsucessfully to post over the last few days–more examples of iPhone “art”. What is particularly interesting to an unskilled artist (i.e. me) is the way that one can use the technology of the iPhone and the “Brushes” painting app to compensate for various gaps in training, talent and circumstances. Of course, becoming adept at the technology is itself a skill, but again, the application and equipment allow one latitude for circumvention. 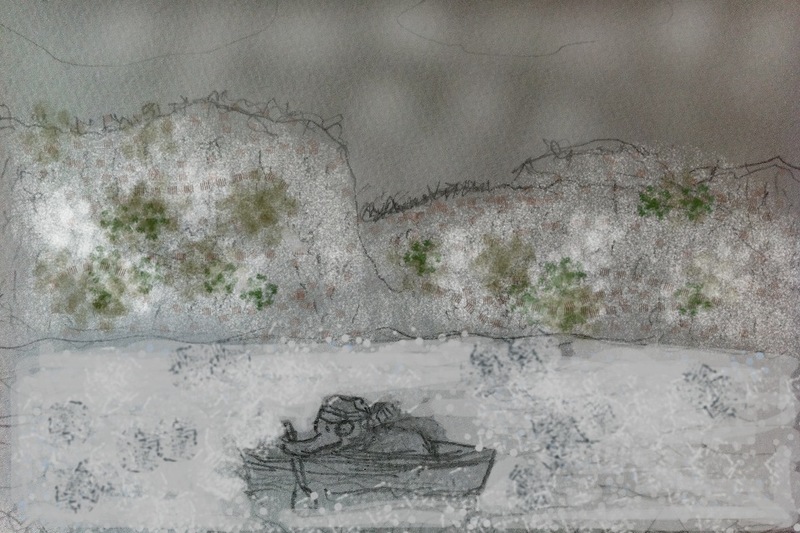 My favorite hybrid method is to make a pencil drawing on paper, photograph it with the iPhone, transfer it to the “Brushes” app, and then embellish/paint in. 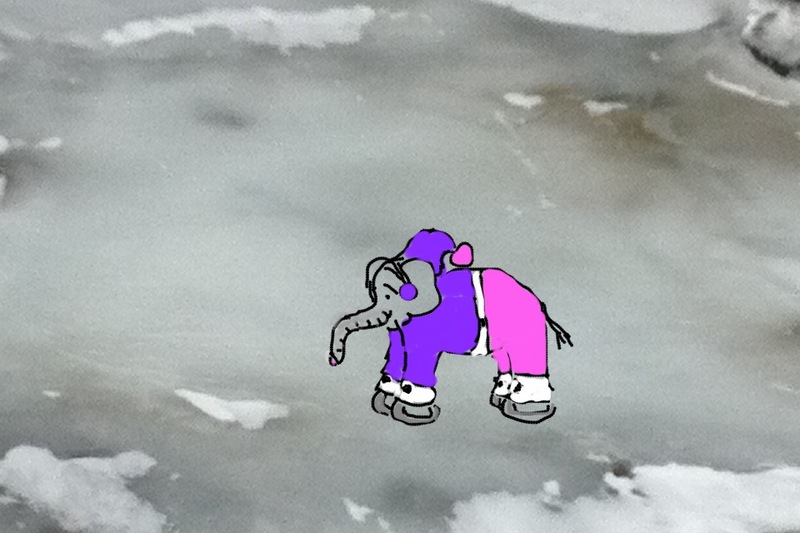 Here was my first elephant in real landscape, an iPhone photograph of ice. Back from a Northern outback, that is, a place that was very cold and had no true reliable internet access. I am not really such an physically un-present person that I need, at all times, the cocoon of the virtual world. But I am someone who does like to accomplish (sort of) what I start. So once I tried posting (and my apologies again for all the confusion), I tried for a while, even though catching enough “net” for transmission was like trying to carry a fistful of rain, to capture running water in a sieve. But… but… but… when I finally went with the icy flow, gave in to the snowy non-electronic cocoon of the Northern here and now, all was just fine. 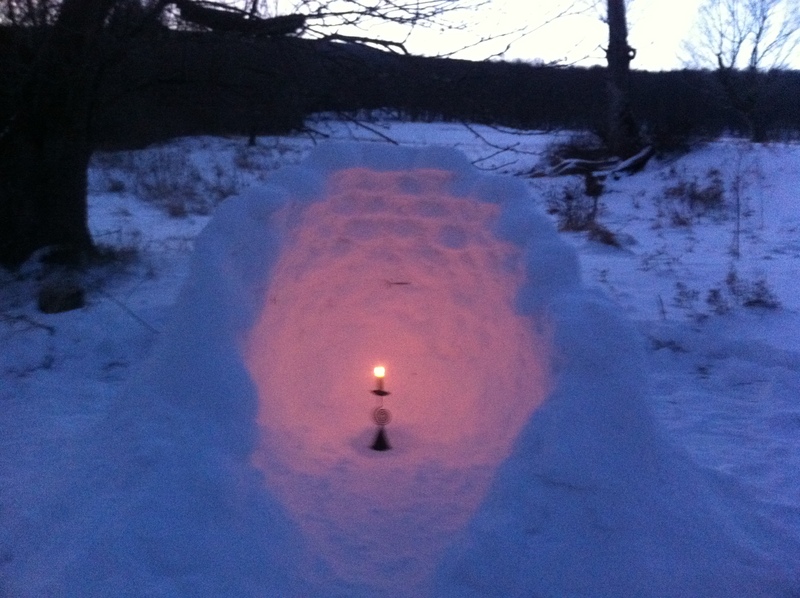 PS – I only tangentially participated in the construction of the above yet-unfinished igloo, i.e. I occasionally knocked some piece off when trying to help. 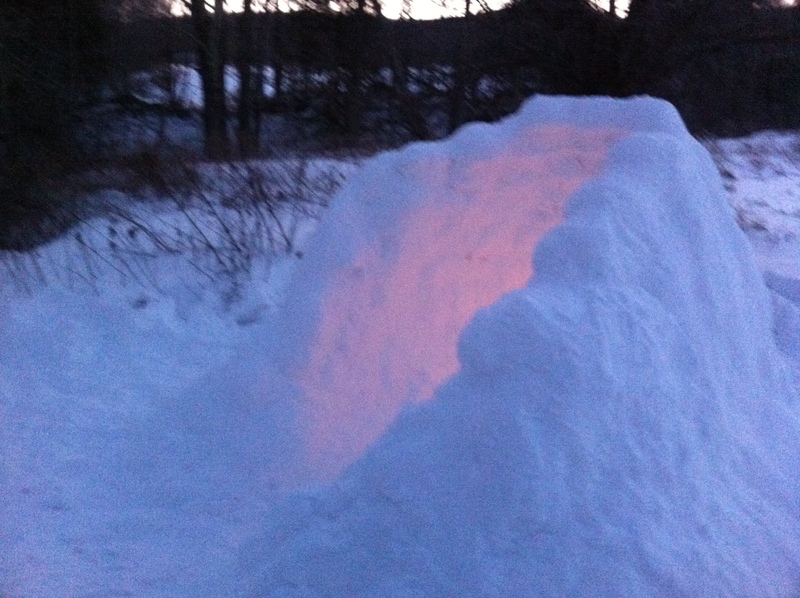 PPS – I did hand up a fair amount of snow to the more architecturally talented. Another day without a true Internet connection , even with –especially with–the iPhone. Oh well, painting with your phone is pretty great and did you know that you can even paint on photographs? Taken on your phone! Sorry for all the duplicate posts yesterday. 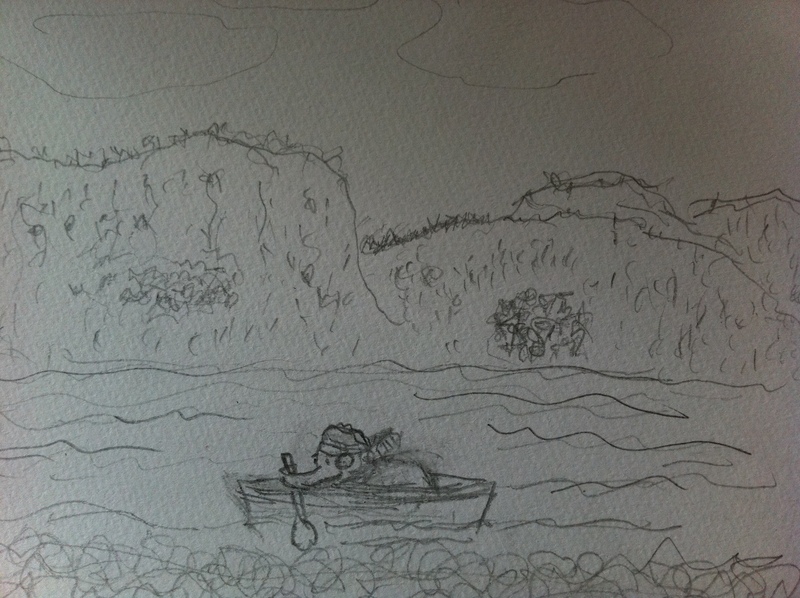 At any rate, last night I tried all my blogging wiles to post a painting. These included reposting it at various pixel levels and marching up and down the nearest snowy hill with a headlamp strapped just below my hat. Here’s painting done on train along the Hudson with the wonderful Brushes app. I’m now in the Catskill Mountains trying to post without Internet access. For a computer junkie, this is a bit like paddling up or downstream (in a storm). One more try. 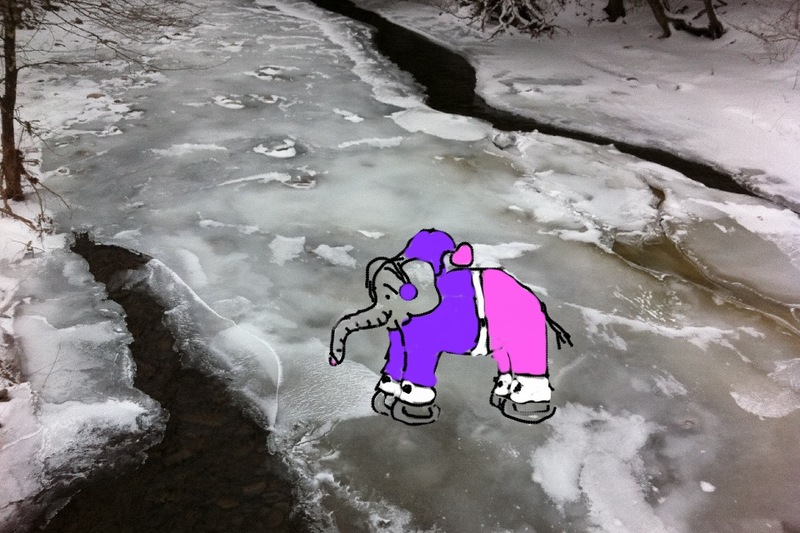 iPhone paintings may be made in almost any circumstances I.e. along the Hudson in a train. Alas posting from a place with the barest satellite connection i.e. the mountains is not so easy.